During the current war, there has been a lot of talk about disarming the militias - Hezbollah and the splintery militant groups of Gaza. It is incanted by quite sensible people who ought to know better and think a little further - including the foreign secretary of UK and the secretary general of the UN. It's part of the pious hypocrisy that characterises the response of the West and many other countries to the recent violence - as if to demonstrate that we know what's best and we care. Yet, my own country, Britain, has been party to the unrequested invasion of two countries in the last five years, and is the second-biggest arms supplier in the world. Then there's the pious calling for a cease-fire. Excuse me, but this is fatuous hot air. Once a war has started, it will not end until the winning side has reached at least a satisfactory outcome, according to its objectives. So a cease-fire is not on the cards, and to call for one is head-in-the-clouds stuff. The issue is that wars should never start - they represent an enormous failure of relationship. Once they have started, they must unfortunately drag on to some sort of conclusion, and it is naive to think otherwise. So what's this about disarming militias? Do you honestly believe that the weaker side in a conflict will surrender its arms, giving the stronger side the capacity to walk all over them? If Israel wishes to invade Lebanon again, are the Lebanese, whether or not they support Hezbollah, supposed to lie down and accept them? Israel has been at war regularly since the 1940s, and it shows few signs of stopping this habit. Its economy, society and international relations depend on it. So recommending that militias be disarmed is a hypocrisy. It will not happen. Only one kind of disarmament is possible: complete, comprehensive, global disarmament. Owing to the dominance of the strongest and the vulnerability of the weakest, the strongest countries need to take the initiative - ratchet down first, to convince the small guys that they can be trusted not to take advantage. All nuclear powers should disarm - not just Iran, and not excepting anyone, for any reason. Since states as well as militias terrorise, both should disarm. Both should scale down the industry, social structure, funding, armed forces and psychology that support and encourage military force. This is the only form of disarmament that is possible and viable. It's a long haul, given the state of things today, but it's possible in thirty years - starting now. If not, starting when? Pie in the sky? This is less crazy than the statement repeated over and over, that militias should disarm. They never will. But there is never a mention of Israel, USA, UK or others disarming. Israel's need to defend itself is repeatedly supported. Well, that's acceptable if the same rule is applied to any threatened people - except that we then get an arms race, and arms are manufactured to be used. There is some legitimacy to militias possessing arms, in the current context. This has been demonstrated in Palestine: the Palestinian people and Hamas declared hudna or cease-fire in 2004, stating an intention to move toward peace with Israel by creating a quieter space in which mutual confidence may be rebuilt. Meanwhile, the Israelis continued to use their troops to harass, block travel and trade, take possession of Palestinian land, build The Wall and impose their will. This was one of the main causes of the current conflict: bombed nightly, Gazans were faced with a choice to take their losses lying down or to fight back. This is where the current nightmare started. 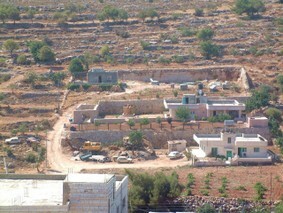 Look at the picture here: this was a house-demolition outside Bethlehem to which I was a witness, taking place in July 2005 during the cease-fire, backed up by Israeli troops (you can see them, plus Palestinian and European protesters). The demolitions took place to clear the way for the building of the security wall. The residents had been given two months' leave to appeal in the Israeli courts, and the demolition squad arrived after one week. That's called 'facts on the ground'. It's time to end this hot air about disarming. It's time to get real. If we're to have disarmament - I am all in favour - then it needs to be on all sides. Otherwise, forget it. To quote Bertrand Russell: "War is not about who is right - it's about who is left".